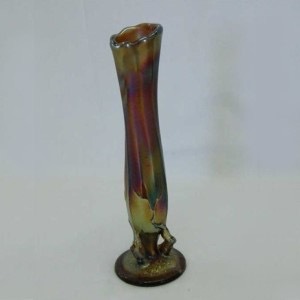 Pattern Description: Paneled vase pinched in just above a flat base (short version). Three twig like protrusions come out of the base and then join the vase. The twigs then continue up the side of the vase. The pattern is named after the twig-like branches making up the short stem (continuing up the side). The top of the base has a bark-like texture. 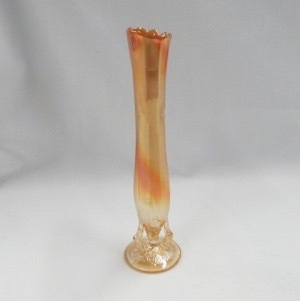 There are two distinct sizes, the short vases between 3 1/2″ and 5″ are much more collectible, the tall are 7″ and above. It's believed that Dugan made the short ones between 1909-1913, after the business was purchased by Diamond, they made the taller ones from 1916-1931. A scarce variation is known without the twigs molded into the side. 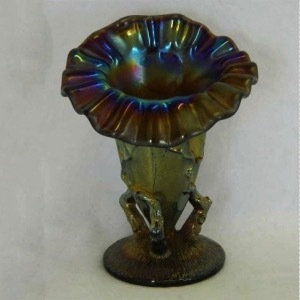 Terry Crider iridized some of these (and signed them). The opalescent versions are of questionable age.